Bespoke Summer Houses - Who Has The Best Bespoke Summer Houses? A summer house can be a useful and elegant edition to any garden, but bespoke summer houses take the hint of luxury, and the versatility of the building, to an exciting new level. 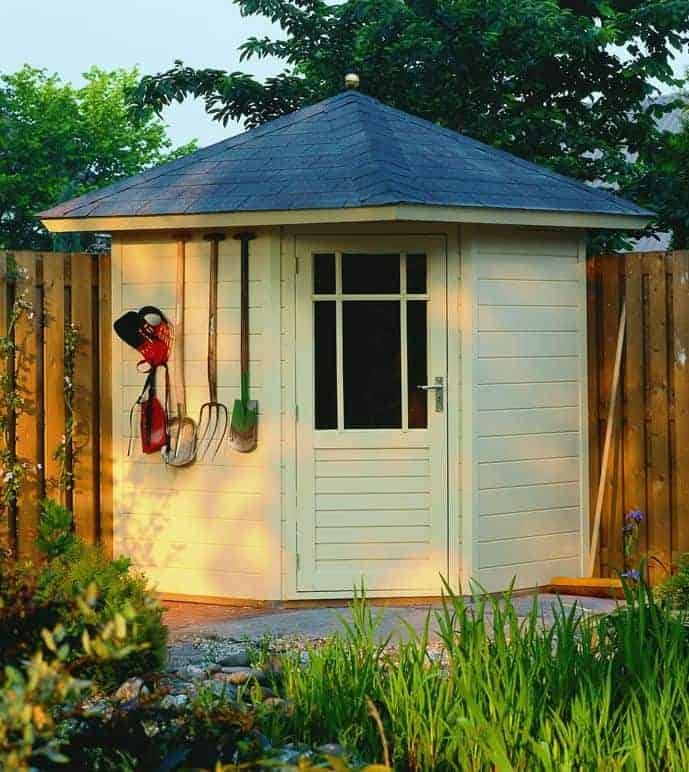 A bespoke summer house is a garden building to be proud of, especially as you can be sure that your friends and neighbours won’t have one that looks the same. If you’re looking for a customisable summer house that’s just perfect for you, then check out our handy WhatShed guide to the top bespoke summer houses that can be bought online in the UK today. Although there is rather a limited number of bespoke summer houses available to buy, we were pleased to find five very high quality examples for our league table. We then ranked them based upon criteria such as price, value, design, durability and aesthetic appeal. When creating this guide to the very best bespoke summer houses we first had to discard those which used loglap cladding and which were therefore log cabins. To be eligible for consideration, a summer house had to offer the customer several customisation features, so the ability to add a colour on its own wasn’t enough. This reduced the number of summer houses to choose from greatly, but we still found five great bespoke summer houses that were eligible for our league table. With each summer house being very different, even before the customisation is applied, selecting an overall winner was a difficult task. It’s well done then to the BillyOh 6000 Diplomat which, by means of the number of customisation options it offers and it’s remarkably good value for money price tag, tops our league table of the very best bespoke summer houses that can be purchase online in the UK today. 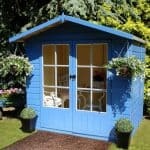 From summer houses to sheds, and more, WhatShed bring you the independent reviews that can help you make an ideal purchase. All of the bespoke summer houses to feature in our top five league table are high quality garden buildings that offer something special to the consumer, and they all have some degree of customisability as well. 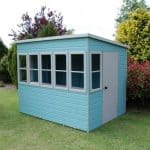 This often brings a substantial base price tag as well, which is why we were so impressed by the highly affordable asking price of this reverse apex summer house from BillyOh. 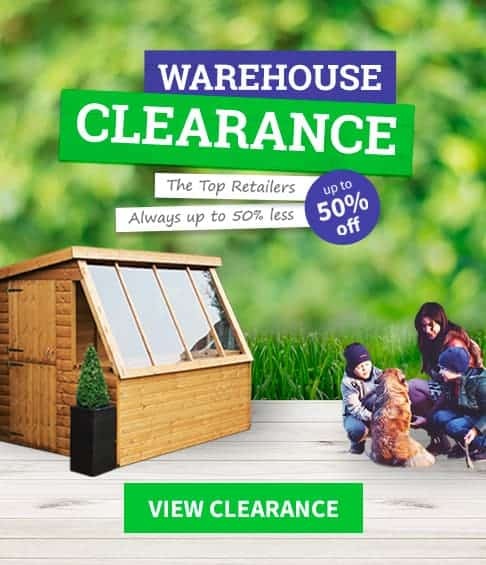 The price tag of less than nine hundred pounds for a very attractive eight foot by ten foot summer house is much less than we would ordinarily expect, and with the reassurance of a 10 year warranty, and lots of customisation options as well, this deservedly takes top spot in our run down. Even in its bare unadulterated form we found this one of the most eye catching and aesthetically pleasing bespoke summer houses we’ve reviewed, with its centrally positioned doors flanked by Georgian style windows. On top of this, the customer can select from 17 wall and trim colours, choose whether to upgrade the cladding, select the colour of the roof and more. Guttering and shelving can also be added, and we were pleased to find security options provided as well. 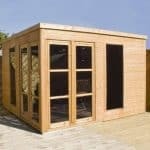 This gives a truly bespoke and high quality garden building, at the price we’d expect to pay for an off the shelf summer house. 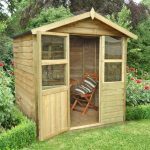 We’ve reviewed lots of garden buildings, in various styles, from the Champion range, and they live up to their name thanks to their high build quality and durability. We were pleased to find that their bespoke summer houses didn’t let them down and if it wasn’t for the fantastic value for money offered by our table topper this could well have taken first place. The first thing that struck us about this mid sized summer house, which has a base area of approximately ten foot by eight foot, is that it has a lot of glazing thanks to its fully glazed double doors and four large windows as well. We were glad to see that toughened glass had been used throughout, which is virtually shatterproof and therefore an aid to security. With so much glass, the interior will be bathed in light on a sunny day, making this a great place to relax or to work in. We were also impressed by just how tough these bespoke summer houses are, with the 12mm shiplap cladding being supported by a 32 x 57mm frame, which is much thicker than we usually see on the summer houses we review. Even more importantly, all of the timber has been pressure treated, giving it long lasting protection against rot as well as a 15 year guarantee. 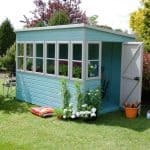 The customisation options allow the customer to have double glazing installed and lining added, to create a warmer environment all year round, as well as an optional slatted roof and the ability to have the summer house painted in a chosen colour. One of the best things about bespoke summer houses, especially the high quality models that we find in this league table, is that they are among the most versatile garden buildings that we see. This pent roofed garden room is a perfect example of that. With a spacious twelve foot by eight foot interior this could easily be used as an extension to the house itself, and could easily be converted into a gym or spa, or a guest bedroom. 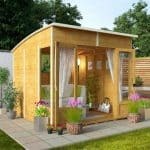 Thanks to its fully glazed nature as well, we can imagine this being used as a garden office for people who have a home run business. That’s why we were pleased to see that two of the windows could be opened, allowing for quick, easy, and effective ventilation. With a price tag of more than three thousand pounds, this has to be tough and durable, which is why we were so glad to find that these bespoke summer houses carry a very reassuring 15 year guarantee. This shows just how effective the initial pressure treatment used on the timbers is. 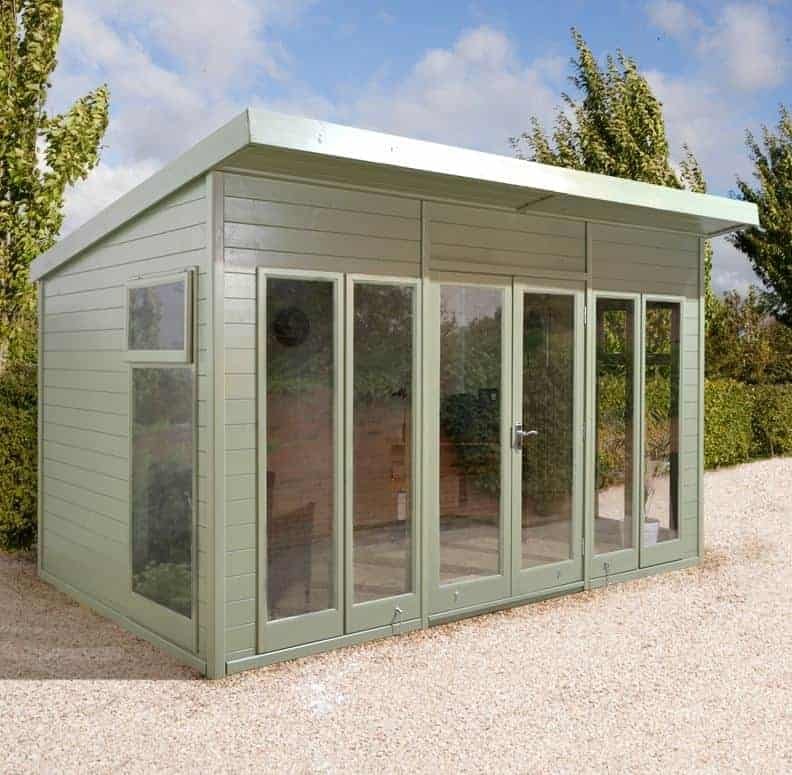 As well as an optional installation service, it was good to see that customers can opt to have the summer house painted in a colour of their choice, as well as having it lined internally as well, creating a striking and luxurious addition to their garden. 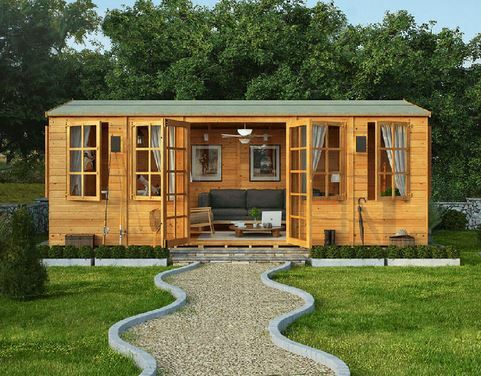 This is the largest of all the bespoke summer houses in our top five league table, and it’s base width of 4.29m and width of 3.08m means that this is easily large enough to be used for either business or leisure purposes. The half glazed design make this one of the most attractive and classically styled summer houses that we’ve seen, and the toughened glass windows ensure that a plentiful supply of natural light reaches every corner, which is why we think this would make an ideal purchase for those who want a spacious and comfortable office in their garden. There’s more than enough room to place furniture inside as well, making this a great place to relax and look out at the garden. That’s why we were pleased to see that lining could be added to these large bespoke summer houses, making them suitable for use even in the cooler months. To create a truly individual appearance, however, the customer will want to take advantage of the painted timber option. This also adds an extra protective layer, and as the timbers have all been pressure treated and come with a 15 year guarantee, this should prove to be a very durable summer house. We also liked the option to add shingles to the reverse apex roof, and it’s only the lofty asking price that stops this achieving a higher position. 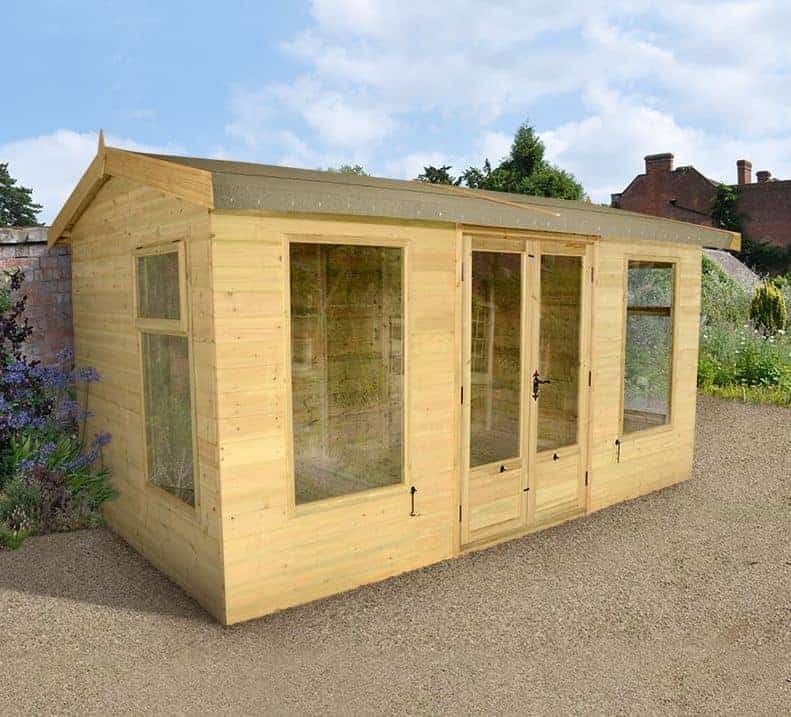 With a base area of 1.80 x 1.80m these are by far the smallest bespoke summer houses to gain a place within our WhatShed league table, but this in itself can be a significant advantage for those who have a smaller garden but still want to enjoy the benefits that a unique and well built summer house can bring. It also boasts a design that’s unlike any other of the summer houses in this list, in that it’s octagonal, and its eight sides create a very eye catching structure that we think could well make it a garden feature in its own right. The eight sided roofs on these bespoke summer houses take on an almost conical shape, but what made them stand out for us was the attractive and rain repelling shingles on the surface of the roof. We were pleased to find these shingles can be taken in one of five colours. Other customisable options include the choice of either a brass ball, chrome ball or traditional weather vane for the finial, and there is also a choice of colours that can be added to the walls and floor in the form of a semi-translucent stain. 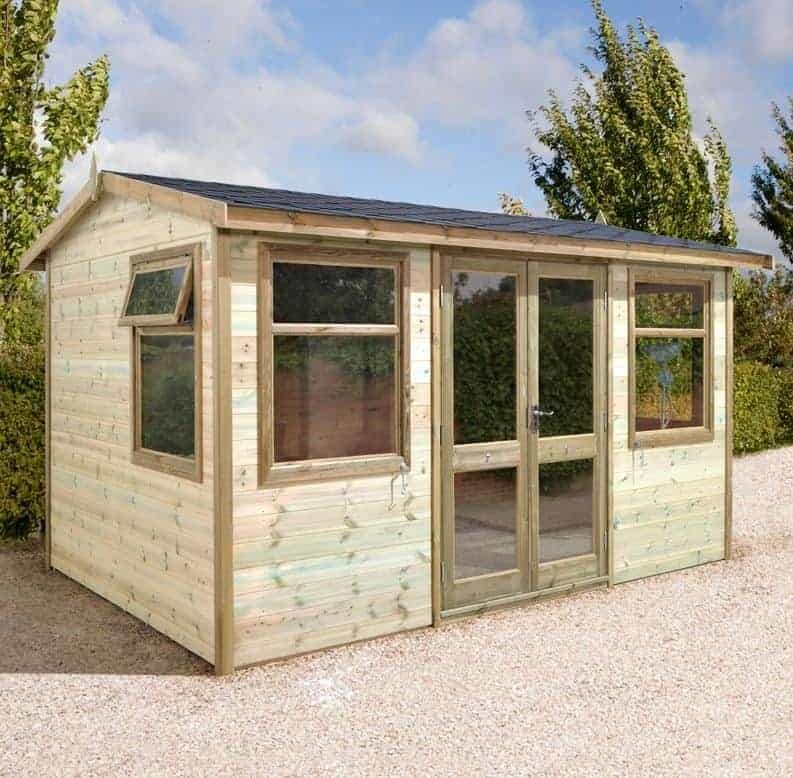 The only downside is the lack of any extended warranty, but with high quality components used this should still prove to be a durable summer house, as long as it’s given an annual preservative treatment by the customer.